The thing is, most people think there is a lot of bad people running around in the world. There aren’t a lot of bad people. There are a lot of bad ideas, and bad ideas are worse than bad people, ’cause bad ideas are contagious, bad ideas get good people to do horrible things. The following video and the text below it cover the same material. 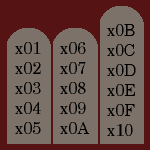 The text is a slight modification of the script for the video. 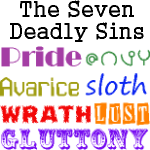 It includes links, full book titles, and is slightly rewritten from a blog perspective. The video has pictures. Sam Harris is talking about bad people vs bad ideas. And I actually wrote my Ph.D. dissertation on what it means for a person to be evil. This has actually made me slower to call someone evil, and I’m in agreement with Sam Harris that it’s more commonly bad ideas that prompt people to bad behavior than it is having a bad character. To illustrate what Sam Harris is talking about, I’m going to use the the example of Adolf Hitler and the Nazis. The name of Hitler has basically become synnoymous with evil. When we think of Hitler, we normally think of evil. And when we think of Nazis, we normally think of malicious monsters who brutally murdered people. In fact, when people want to criticize a political leader, it is common to compare him to Hitler. And Hitler has become such a hot potato that Christians want to claim that Hitler was an atheist, and atheists want to claim that Hitler was a Christian. An important thing to bear in mind about Hitler is that he wasn’t just a thug who wanted to butcher people. He was a man of ideas. He wrote a book called Mein Kampf – My Struggle: Unabridged edition of Hitlers original book – Four and a Half Years of Struggle against Lies, Stupidity, and Cowardice , in which he goes into detail about his ideas about how the Jews were a threat to German culture and civilization, and how it was important to stand up to the Jews and do something about them in order to preserve the purity of German culture. To give you a sense of the ideas that Hitler held, let me quote a short excerpt I found while browsing through Mein Kampf (The Ford Translation) . As Hitler portrays himself here, he is a hero who was trying to save the world and civilization from destruction by the Jews and the Marxists, not a monster who was bent on destroying the world. It’s not the purpose of this video to determine once and for all whether Adolf Hitler was evil. But I do want to point out that he did have bad ideas, and it is through the spreading of his ideas, rather than through converting all of Germany to the dark side, that Naziism came to power in Germany. One of the main methods used to spread bad ideas is the use of propaganda, which can work particularly well with mass media. An important part of the puzzle came to me while I was reading Writing on the Wall: Social Media – The First 2,000 Years by Tom Standage. This is an account of social media during the first 2000 years. I was reading a chapter on radio, and, as you know, radio began in the 20th century. And it was a new form of mass media that people could use to spread their messages abroad to other people, to a much wider audience than they could reach before. And the Nazis decided to build radios known as Volksemfangers, which means the people’s receiver. They sold these radios to the German people, and these radios were designed to easily pick up German radio stations but to not so easily to pick up foreign stations. And they used these radios to spread the propaganda of the Nazi party to the German people. Also, during World War II, the Nazis made it illegal to listen to foreign broadcasts. So they were relying of radio to spread their message further and wider than they could have previously done without this new technology. When Hannah Arendt went to Jerusalem to witness the trial of the Nazi Adolf Eichmann, she was expecting to find a monster, but what she found instead was a banal man whose stupidity or willful refusal to think led him to not question the orders he had been given. Some people, sometimes as a way to escape a sense of guilt or responsibility, prefer to let others think for them. Eichmann was probably this sort of person. He would not have pushed for the holocaust on his own, but his unthinking acceptance of authority led him to go along with it. When it comes to the spread of bad ideas, we should not overlook the fact that some people are all too willing to let others think for them. Since Eichmann didn’t question Hitler, let’s now reflect on the passage I read from Mein Kampf and question it ourselves. In case you didn’t already notice when I was reading it, it is incredibly stupid. Hitler conflates Judaism with Marxism, as if, just because Marx is a Jew, all Jews are Marxists. This makes as much sense as saying that all Jews are capitalists, because Ayn Rand is a Jew. As much sense as saying that all Jews are scientific geniuses, because Albert Einstein is a Jew. And as much sense as saying that all Jews are scientific crackpots, because Velikovsky is a Jew. Could Hitler have really been this stupid? According to Annie Jacobsen, the author of Operation Paperclip: The Secret Intelligence Program that Brought Nazi Scientists to America , the Nazis didn’t make the atomic bomb before the Americans, because Hitler considered it Jewish science. So, yes, Hitler may have been this stupid. But not all Nazis were stupid. Operation Paperclip brought in several Nazi scientists, some of whom helped put men on the moon. Separated from a regime bent on genocide, men who had participated in Nazi atrocities were able to put aside the Nazi agenda and focus their efforts on more benign projects. Many of them were probably like Eichmann, banal people who were too willing to follow authority, wherever it led them. Propaganda, stupidity, and deference to authority are three ways people fall prey to bad ideas. In each case, the willingness to critically examine what you are told is crucial. Communism is another example where bad ideas lead to bad behavior. It began with the philosophical writings of Karl Marx and Friedrich Engels, and it led to the communist revolutions in Russia and in China and other countries. And in Russia, for example, Stalin was responsible for the deaths of millions of Russians. And in other countries, the leaders were responsible for the deaths of many people in those countries too. During the Middle Ages, the Roman Catholic church would torture people for heresy during what was called the Inquisition. And the idea behind this was that if the Catholic church did not take this drastic action with these heretics, they would go to Hell and burn or be tortured for all of eternity. So from their perspective, they were doing these people a favor by doing whatever they could to lead them towards correct belief. Although the medieval Catholic church did not have mass media like the Nazis did during the 20th century, they still had a tight control over the flow of information. Instead of letting people read the Bible for themselves, they would tell people what the Bible said. It was actually thanks to the invention of the printing press that the Protestant reformation was made possible. This allowed people to read the Bible for themselves, and it allowed Martin Luther to engage in dialogues with the Catholic church, which could be read by the masses at large, which enabled him to reach a large audience with his criticisms of the Catholic church. And this is what ended the stranglehold that the Catholic church had on the flow of information during the middle ages. During the 21st century, Muslims have been committing acts of terrorism, because they believe this is the will of Allah and they will be rewarded for this in Heaven. One thing that the Nazis, the Communists, the Christians, and the Muslims all have in common is that they have books which describe the ideas that their beliefs are based on. And these ideas can be criticized by people who read these books and understand what they’re saying. Because bad ideas have the power to lead people into doing evil, it’s important to be aware of these ideas and to actively criticize them, to expose them as bad ideas. 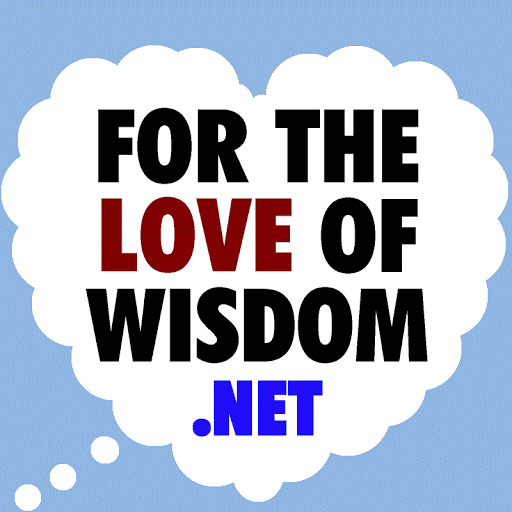 One of the purposes of this blog is the exposure and criticism of bad ideas. And here are a few articles that do that. Here’s one on why There is No Eternal Damnation in Hell. And here’s another, called Who Thinks for You?, exposing the tricks that propagandists use to trick people into believing things. It is actually an article from a Jehovah’s Witness magazine that describes very accurately what propagandists actually do, and, of course, you would expect Jehovah’s Witnesses to actually know a thing or two about that. Then here’s one, called The Double Standard Behind Benatar’s Asymmetry Argument for Anti-Natalism, in which I’m criticizing an argument made in favor of anti-natalism, the idea that procreation is always morally wrong, an idea that if everyone followed it would lead to human extinction. 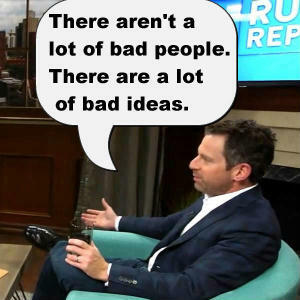 I agree with Sam Harris (@SamHarrisOrg) that bad ideas are worse than bad people. 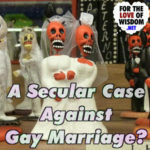 A Secular Case Against Gay Marriage?